Andre Gisson was born with the name Anders Gittleson, in Brooklyn, New York but lived in Westport, Connecticut for most of his life. He traveled extensively and studied throughout Europe and the Far East. Mr. Gittleson was a leading American realist painter. He graduated from the Pratt Institute and was a Captain in the Army during WWII. Over 4 decades his one man shows extended from New York, Washington, Texas, and California to London, Paris, and Tokyo. His work is in the collection of the Smithsonian Institute and the Tritan Museum of Art in North Carolina. Among his private collectors were President Lyndon B. Johnson and W. Somerset Maugham. 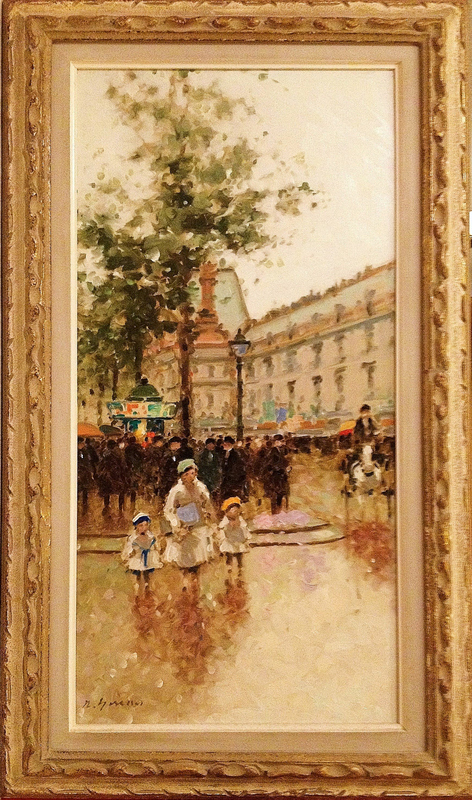 Mr. Gisson/Gittleson is a listed artist with extensive auction records. He is listed in "Who's Who in American Art" and after his death in July, 2003 became highly collectable. This wonderful piece is not only a fine addition to any collection but a fine investment in art.